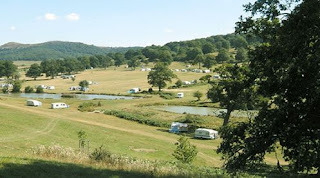 Hiking, Backpacking and Wild Camping Blog: Wild Caravanning? It's been a long time since my last blog; too long. But now its time to pick myself up and start writing again. We've not done much hiking so far this year, but I do have a few places to tell you about. The site was mainly filled with caravans but served its purpose giving us somewhere to camp before the season really got started. There was a lovely site down the road, next to the river which looked peaceful and something a bit special, so if I went again, I'd check out whether that was busy. The walk was nice, but overall not a stand out walk. The bit I do remember is bird watching with the park warden; we stood for ages watching a number of buzzards and kestrels flying over the fields searching for food and calling to their young. On the Sunday we drove over to Sheen to check out a random patch on the map before heading home and found the most glorious wild camping spot, up through the woods looking out over the vista with Hartington to the right. I could have sat up there for hours. And then in May, Phil dropped a bombshell - he'd bought a caravan. “A caravan? !” I said, imagining Jeremy Clarkson turning up at the door to share his thoughts on such monstrosities. Aren't caravans for old people, and you just drink tea and empty the toilet? Well I've kind of been converted I'm afraid. Only for the right situation of course, there is still nothing that can beat wild camping in Wales when that is what you need to do. But sometimes, when you've been working all week and you've only got a short weekend before it all starts again, it's quite nice to take some decent food, a bottle of cider and a guitar and still be out in the countryside but just be a bit more chilled out. Plus neither of us for various reasons have really been in the right state of health for tough weekends walking and camping. And so since then we've had a couple of great weekends in the caravan. But don't stop reading here, we've not just been to any old caravan site, a big square field where people keep their home away from home. Oh no, we've been to two wonderful sites. The first was at Eastnor Castle, in the Malverns. There are no facilities, simple, just the way we like it. Camping on the castle estate, in the deer park, with the castle looking down on you from the hillside it really is a fantastic location. And within a couple of paces we'd found our own private little walk amongst the wildlife. Head up to the Obelisk and the Malvern Hills stretch out invitingly to the left and right. We had a great time hunting the elusive deer in the park, not one was seen! Ledbury, the nearest town is also well worth a visit, with some great shops and an art gallery and there we found ourselves a rabbit for a delicious rabbit stew. The next site was a real last minute plan. The idea was to head to Wales but the weather came in and it looked like it was going to be a truly awful and potentially dangerous weekend to be up in the hills. So we headed over to nearby Cannock Chase. My preconceptions weren't that I was going to be impressed. However I'm so glad we went. Cannock Chase is designated an Area of Outstanding Natural Beauty and even in the rain it truly is. The area we went to was mile upon mile of forest, like you've never seen. 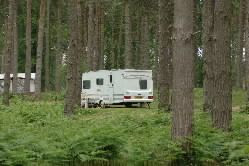 The caravan site is owned by the Forestry Commission and you pitch your tent in amongst the trees in way that almost feels like wild caravanning! And I honestly think, even on a perfect weekend, if you picked your route carefully, you could walk through the forest for quite some time without seeing a soul. Oh and we finally found those deer (or maybe they found us? ), as they crossed the path in front of us and then froze among the trees whilst we stood watching them until finally moving on. That's it for now, but the idea is to get some walking in next weekend, so I'll try not to leave it months before sharing it. I'm off to make some plans...the Dark Peak perhaps?